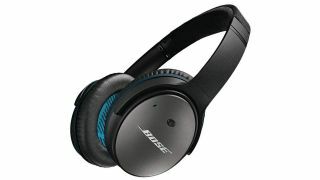 Save 55% on Bose QC 25 noise-cancelling headphones | What Hi-Fi? The Cyber Monday sales continue and you can still make a big saving on the Bose QuietComfort 25 noise-cancelling headphones. There is currently 55% off the original price, with the headphones now down from £289.95 to £124.94. That's a healthy saving of £160.01. Don't forget that penny. Award-winning headphones when they were first released, they still offer great noise-cancellation, making them ideal for planes and trains, as well as a clear, balanced sound, and a comfortable fit. If you want the latest models, complete with wireless Bluetooth connectivity, then take a look at the Bose QC 35 and the Bose QC 35 II. But these QC25 headphones remain good value, especially seeing as they're still available at quite such a low price this Cyber Monday.